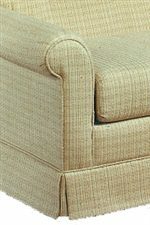 Smooth curves and traditional details create the casual style of this upholstered chair. This chair features soft rolled arms, tufted seat back and a skirted base. A plump seat cushion will keep you comfortable while you enjoy reading, relaxing or watching a movie. Multiple fabrics are offered so you can find the ideal fit for your space. The 2000 Upholstered Chair with Tufted Seat Back by Lancer at Westrich Furniture & Appliances in the Delphos, Lima, Van Wert, Ottawa, and Celina area. Product availability may vary. Contact us for the most current availability on this product.